Središče ob Dravi (pronounced [sɾɛˈdiːʃtʃɛ ɔb ˈdɾaːʋi], German: Polstrau) is a town and municipality in northeastern Slovenia. It lies on the left bank of the Drava River and borders with Croatia. The parish church of Središče ob Dravi is in the neighbouring village of Grabe. The church in the actual settlement of Središče ob Dravi is a chapel of ease and is dedicated to Mary of the Seven Sorrrows. It was built in 1637. In the 18th century the nave was vaulted. ^ Leksikon občin kraljestev in dežel zastopanih v državnem zboru, vol. 4: Štajersko. 1904. Vienna: C. Kr. Dvorna in Državna Tiskarna, p. 230. 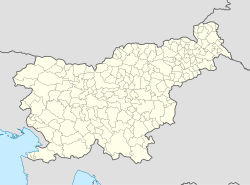 This article about the Municipality of Središče ob Dravi in Slovenia is a stub. You can help Wikipedia by expanding it. This page was last edited on 23 January 2018, at 16:33 (UTC).